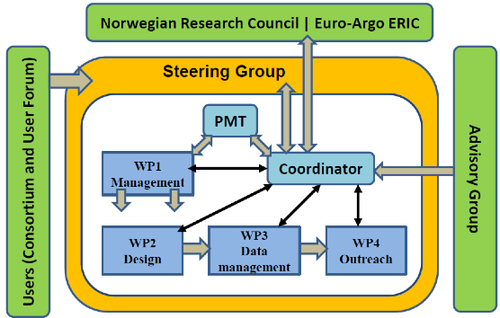 The structure for management and procedures of NorArgo2 including the four WPs is shown in Fig. Figure. Graphical view of the components and their inter-dependencies. The Coordinator (IMR) is the legal entity acting as the intermediary between the Partners/parties and NRC. NorArgo2 will be coordinated and managed by Dr. Kjell Arne Mork (IMR). The project management team at IMR (PMT) will provide administrative and management support to the Coordinator. PMT consists of project leader (Kjell Arne Mork), project administrative manager (Anita Jacobsen), and project financial officer Turid Loddengaard. The Steering Group (SG) The overall steering of the project lies in the responsibility of the SG which is comprised of delegates including representatives from all of the partners, program leader (IMR), project leader from a similar infrastructure. SG will be the overall decision making body. Work package leaders (WPLs). The work of the project will be organized in four work packages (WPs). - Develop and maintain a cost-effective array of Argo floats at the appropriate density with respect to float types and carried sensors. - Fill observational gaps for under-sampled areas and for new ocean variables. - Disseminate NorArgo2 and the use of the Argo data, also to non-experts.